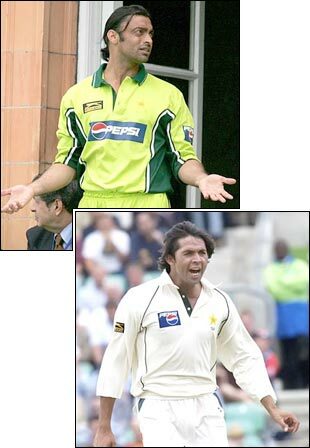 Prior to Pakistan's opening match of the Champions Trophy against Sri Lanka, in Jaipur on Tuesday, Pakistan fast bowlers Shoaib Akhtar (top) and Mohammad Asif (bottom) tested positive for a performance-enhancing drug. The results of the tests, conducted by the Pakistan Cricket Board before the players left for the limited-overs tournament in India, were out on Sunday night. Both cricketers face bans of up to two years if a second test confirms the positive result. WADA, the World Anti-Doping Agency, and the International Cricket Council had an understanding as per which the cricketers would undergo random testing during the Champions Trophy.